New research has uncovered which sector is most likely to pull a sickie and it turns out HR are a somewhat honest bunch. A quarter of workers across all sectors that call into work sick admit they are ‘rarely ill’ on the occasions, with employees in the retail sector the worst offenders according to new research. 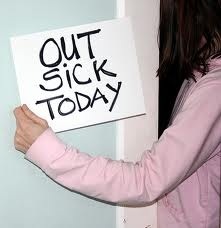 A poll of 1,921 employees by vouchercloud.com found that 39% of retail staff confessed when they called into work sick they rarely were. Sales and marketing (33%) and people working in customer services (28%) round out the top three sectors for lying to their employer about a sick day. As for those working in recruitment and HR, the results show they are generally telling the truth when calling in sick with only 11% admitting to pulling a ‘sickie’. Across all sectors, 45% of those surveyed said they were genuinely ill when they rang in unwell ‘most of the time’, while only 29% agreed that they were ‘genuinely ill’ every time they had taken a day off citing ill health. The top reason for taking a sneaky sick day was hangovers, with 27% admitting a big night out had them lying to their employer. Shopping (19%), utilities appointments (17%), planned activities such as days out (15%) and job interviews (12%) rounded out the top five reasons cited for falsely claiming to be under the weather. Over half of those who admitted their dishonest behaviour have a conscience, with 61% admitting to feeling guilt about their actions. The main reason identified for feeling guilty was that they felt they had ‘let their colleagues down’ because their colleagues would have to bear the burden of their absence. Only 27% ‘felt bad for their employer’. Do you agree with the findings? Let us know in the comments below.